The old Florida Brewery Company building, now Swope Rodante Law Firm, is the tallest building in Ybor City. Before it was a brewery, and even before the founding of Ybor City, the land beneath the building as coveted and developed because this is the site of the Government Spring. Discovered in 1824, the spring provided water to Fort Brooke, and a swimming pool and ice factory were built around its waters. In 1896, Vicente Martinez-Ybor decided to try his hand at brewing beer. 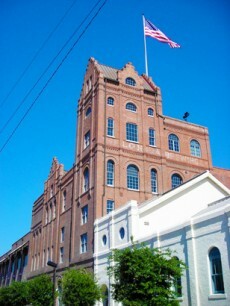 The successful Florida Brewing Company produced beer until 1961. A cigar company then took over the space, bricking over many of the windows to keep the tobacco fresh. During the Cold War, it even served as a bomb shelter. After all these uses, the building fell into disrepair and the tower and roof collapsed. In 1999, millions of dollars were spent restoring the building. It now serves as the offices for Swope Rodante Law Fim.